CHICAGO -- Anaheim Ducks coach Bruce Boudreau appeared to hit the bulls-eye last week when asked about the stellar play of Chicago Blackhawks star right winger Patrick Kane. After touting Kane's improved consistency, Boudreau concluded with this gem: "He's getting more like Jonathan Toews every day." Upon hearing the comparison, Kane initially laughed. He and Toews are still polar opposites on and off the ice. Toews is all business, while Kane has vast reserves of flash and dash. They're the yin and the yang for a Blackhawks team that's sitting atop the National Hockey League standings with 51 points, but Boudreau did make a good point. Kane has been more consistent this year, especially on defense. "That was one of my focuses coming into this year," Kane said on Monday. "I knew if it was only a 48-game season that I had to be consistent and ready to play every night. There's really no time for anything else except playing hockey right now. [Consistency] is an important part of trying to be a top player and a player that can pretty much bring the same thing and produce every night." It's worked out great thus far. Heading into a game on Monday night at United Center against the defending Stanley Cup champion Los Angeles Kings, Kane leads the Blackhawks and all Western Conference scorers with 16 goals and 22 assists. He's also third on the Blackhawks with 29 takeaways, behind only Toews and Marian Hossa, and is tied for seventh in the League in that category. If that seems like a surprise, however, it shouldn't. Kane, who would be on pace for 79 takeaways over an 82-game schedule, tallied 77 last season -- when he finished with 23 goals and 43 assists in 82 games. That was the lowest point total (66) of Kane's six-year NHL career, which begs the question: What's the biggest difference this year? Consistency -- as Boudreau aptly pointed out -- is a big reason for it, along with motivation. After scoring the game-winning goal of the 2010 Stanley Cup Final in overtime of Game 6 in Philadelphia, Kane didn't put up the same kind of numbers in the two seasons that followed. A serious ankle injury hindered his 2010-11 season, while several nagging dry spells last year caused his production to sag. "Sometimes you don't put up the numbers that you want, but if you're playing the right way, more times than not you get a few breaks," the 24-year old Kane said. "It's probably taken a little bit longer [to develop as a player] than I'd hoped, but I knew this was going to be a big year for me to prove myself and be one of the top players on the team and hopefully the League." Now that he's reached that "next level," there's no room for complacency. "I think I'm at the point now where I just want to keep getting better and show the fans and myself and whoever's been there for me throughout my career … that I have some special talent and I can use it a lot," said Kane, who has been double-shifted quite a bit the past couple games to compensate for Hossa being out. "This year's been a lot more fun for me personally, especially when we're winning games. I think last year was probably the disappointing one for me." Kane hasn't been the only one enjoying the fun he's has this season. Blackhawks fans and teammates have both savored some remarkable memories. There was a reverse spin pass to Hossa for an overtime game-winner to beat the Edmonton Oilers. There were several versions of his now patented "slowdown" move that decided shootouts. And then there was the jaw-dropping spin-o-rama backhand goal he scored in Dallas that left Stars goalie Richard Bachman looking dazed and confused. It was a carbon copy from the playbook of Blackhawks legend Denis Savard and made everybody watching anxious to see the replays. "He's just such a smart player," Blackhawks teammate Jamal Mayers told NHL.com on Monday. "I've never seen a guy his size just be able to stickhandle around a defensemen [for] as close as he can get to them. It's different for a guy who has a long stick or a big guy, because you can get away from them. He's literally so close to them and they still can't get it. That's pretty cool." Mayers has played with and against a number of stars in his 15-year career, but couldn't come up with a comparable former teammate to Kane. 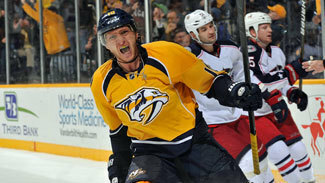 "He's one-of-a-kind, I think, with the short stick and the things he can do," Mayers said. "Pavol Demitra was more of a shooter, and Pierre Turgeon, no disrespect meant to [him], but he didn't have hands like Kane. I think he's his own player." And that's where the Boudreau comparison to Toews runs off course. Instead of getting to be more like Toews, it might be that Kane is just getting to be more like himself -- or what he envisions of himself. "I just try not to be satisfied and keep getting better, even now," Kane said. "Hopefully that's what I'll keep bringing for the rest of the year, because so far it's been pretty good."